It will be an evening of song, dance, hors d’ oeuvres and live and silent auctions as the SHSU department of theatre and dance takes guests “through the years” for the 2004 Scholarship Gala on Sept. 25. This year’s gala, themed to correspond with the university’s 125th anniversary, will be held from 5:30-9 p.m. at Magnolia Lake, at 2001 Highway 30 East. The fundraising event is designed to raise money for scholarships to support theatre, musical theatre and dance students, according to Penny Hasekoester, assistant professor of theatre. This year’s goal is to raise $40,000, which would provide 40-$1,000 scholarships. Not only do students benefit from the gala but perform in every function for the event by performing, meeting-and-greeting and serving guests, Hasekoester said. Performances this year include traditional musical theatre songs, as well as dance performances that allow guests to participate. Tickets are $50 per person, $40 of which is tax deductible, and can be purchased at the University Theater Center box office, as well as at the door. For more information, or directions to Magnolia Lake, call the theatre department at 936.294.1329 or the UTC box office at 936.294.1339. The 2004 Campus Callers will be raising money over the phone Sunday through Thursday from 6-9 p.m.
Bearkats have begun calling alumni and friends to seek support for the SHSU Annual Fund through the SHSU Phone-a-thon. The students, known as Campus Callers, will raise funds for all five colleges through the end of November, calling Sunday through Thursday from 6-9 p.m. 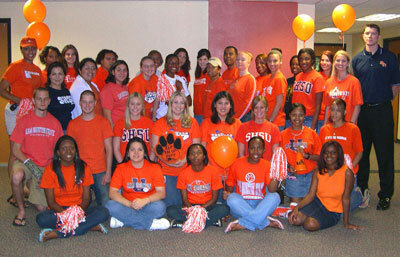 The Campus Callers make thousands of contacts each year raising funds for academic excellence at SHSU. A key component of the program is to build positive relationships with alumni and friends, with the callers giving updates of campus improvements and upcoming events, as well as, collect the most current contact information. For more information about the phone-a-thon, contact Brian Jordy, phone-a-thon manager, or Cindy Truax, assistant director for development. Are you interested in attending Puebla Field School? The Spanish department will have an informational meeting on Tuesday (Sept. 21) for students interested in studying during both summer and regular semesters in Puebla, Mexico. The meeting will be held from 3:30-4:30 p.m. in Evans Building Room 320. Universidad Iberoamericana representatives Carlos Escandon and Alberto Fischer will be on hand to promote the university’s educational program among SHSU’S students. In addition, pizza and refreshments will be served at the meeting. As an incentive for faculty, staff and students to stay active, the Recreational Sports department kicked off its annual FitBucks program on Friday (Sept. 10). The program rewards participants with prizes such as a water bottle, stopwatch, lunch kit, or T-shirt, based on the number of points earned. To participate faculty, staff and students keep up with, and send in, a weekly log filled in with the time spent exercising. Participants can earn points, or “FitBucks,” by doing several different forms of physical activity, including fitness and sports activities, as well as household activities, such as cleaning, or outdoor activities, such as gardening or raking leaves. Other activities may also be included, pending approval by Tina DeAses, Rec Sports assistant director of wellness programs. The program will run until Dec. 3. SHSU School of Music professors music will be showcasing their talents at the annual Friends of Music Faculty Gala on Tuesday (Sept. 21), at 7:30 p.m. in the Recital Hall. The gala will feature original works by pianist Trent Hanna, playing his “Once It Was” and pianist Kyle Kindred’s “Burrowing Owl,” from OWLklahoma. Other faculty performers are Kathy Daniel, flute; Scott Phillips, bassoon; Sohyoung Park, piano; Robin Cobb; David Engler; Henry Howey; Andrew Wilson; and Sergio Ruiz. The gala is held to generate interest for the Friends of Music, according to School of Music chair Rod Cannon, with many people signing up that night. The gala is free to the public, and afterwards, there will be a reception for the ‘friends’ at Austin Hall. Students who anticipate graduating May 14, 2005, are to file degree applications by Oct. 15 in the Registrar’s Office, on the third floor of the Estill Building. Students will have the opportunity to “mix and mingle” with the black faculty and staff on Wednesday (Sept. 22). The “Black Faculty and Staff Mixer,” sponsored by the Office of Multicultural and International Student Services and the Talented Tenth, will be held from 4:30-6 p.m. in Lowman Student Center Room 320. “ The African American faculty and staff will get to introduce themselves, what they get to do on campus, speak a little bit about their backgrounds and how they got to Sam Houston,” said MISS program coordinator Jennifer T. Roberts, adding that food will be provided. SHSU has five new black faculty members this year, though Roberts said she isn’t sure how many new staff members there are yet. Now in its third year, the mixer is designed to introduce the black faculty and staff members to the university, as well as to students of all races or ethnicities. The Program Council will be “rocking the vote” this Wednesday (Sept. 22) from noon to about 3 p.m. in the Lowman Student Center Mall Area to encourage and register students to vote in the upcoming election. Along with registering students, PC will hand out T-shirts that say “I Will” on the front and “Vote 2004” on the back, as well as having students sign pledge cards to vote. Those students who register will also have their names put in the Houstonian, according to Lucy Gonzalez, PC vice president for retention. In addition, members of the SHSU College Republicans and SHSU Young Democrats will hand out informational packets on the candidates from their respective parties; Women United will hand out information regarding women’s rights and the history of women’s right to vote; and Lambda Theta Alpha will hand out information regarding Hispanic voting. According to Gonzales, both George W. Bush’s and John Kerry’s stands on certain issues will affect students in the long run, so it is good to be informed. “ The program is a good way for the students to get to know what will be going on in the next four years, no matter which candidate wins,” she said. Jim Pflugrath of Rigaku/Molecular Stricture Corporation, in The Woodlands, will give the first physics colloquium of the fall semester, on Tuesday (Sept. 21). The colloquium will be held from 3:30-4:30 p.m. in Farrington Building Room 207, and refreshments will be served. Artist Helen Altman will be speaking about her work on Thursday (Sept. 23) at 3:30 p.m. in the Art Auditorium, in Art Building E Room 108. Altman, from Fort Worth, is known for her sculptures made from electric fireplace logs, refrigerators and other household items; her drawings created with fire and smoke; and her large photographic prints on moving blankets. Her work reflects a melancholy about life and death and the loss of natural environments. She has had solo shows at The Museum of Contemporary Art, San Diego, the Glassell School of Art, The Museum of Fine Arts, Houston, the Art Museum of Southeast Texas, the Galveston Arts Center, the John Michael Kohler Arts Center, and has work in several museum permanent collections. In addition, she is represented by Moody Gallery in Houston, Dunn and Brown Contemporary Art in Dallas and DCKT Gallery in New York. The outdoor recreation division of Recreational Sports will be taking students, faculty and staff on a biking tour of our very own state park on Tuesday (Sept. 21). The trip will be held from 5:30-8 p.m. at the Huntsville State Park, and those interested must attend a pre-trip meeting at 5 p.m. at the Outdoor Recreation Building. The cost to participate is $15 for students, $17 for faculty and staff and $20 for guests, which includes transportation, park entry and bike rental. For more information, contact Marvin Seale, associate director of outdoor recreation, at 936.294.3656 or by e-mail at seale@shsu.edu.